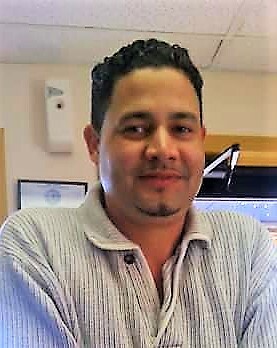 George L. Nieves, 42, of Columbus, GA, was welcomed into the arms of his Savior on April 10, 2018 after an extended illness. George was born in Fort Campbell, Kentucky to Zulma Gomez Soto and the late Nelson Nieves DeJesus on June 21, 1975. He went to various schools in San Juan, Puerto Rico, Fort Benning, Georgia and Columbus, Georgia. He studied web design at the Art Institute of Design in Atlanta. George held many positions, including that as an account executive at Clear Channel in Atlanta, Georgia, a music producer, a floor manager for the Atlanta Hawks at Philips Arena, and as an auto mechanic at Exhaust Pro and White's Automotive in Columbus, and Chrysler in LaGrange, Georgia. He also briefly served in the United States Army. He taught himself to play the saxophone at a young age, and performed his first song at a concert at Fort Benning when he was just 13 years old. He loved spending time with his family, cheering for his beloved Minnesota Vikings, and fixing cars. His last project was fixing up a truck he had purchased for the family in October 2017. He also enjoyed music, horror movies, and playing video games on the Xbox his wife bought him as a wedding present. He married Daree Allen on May 7, 2016 in Marietta, Georgia and immediately accepted her daughter Kaia as his own. He leaves to cherish his memory, his devoted wife, Daree Allen Nieves; his children, Miguel Nieves of Brunswick, GA, Carlos Nieves of Columbus, GA, Maricella Nieves of Brunswick, GA,and Kaia Woodard of Columbus, GA; his siblings, Angel Nieves of Alpine, TX, Christopher Fernandez (Hillary) of Columbus, GA, Crystal Atkinson (Jared) of Clovis, New Mexico, his sister-in-law, Carla Allen of Chesapeake, VA and his brother-in-law, Darien Allen (Rhonda) of Clarksburg, MD; his mother, Zulma Gómez Soto of Alpine, TX; his stepmother Imelda Nieves of Columbus, GA; his mother-in-law, Barbara Allen of Chesapeake, VA; his father-in-law, Darrell Allen of Pittsburgh, PA; his grandmother Rosita DeJesús (Arroyo, Puerto Rico); his grandfather Luis A. Gómez Rivera (Patillas, Puerto Rico); his grandfather George L. Nieves (Fort Lauderdale, FL); and a host of aunts, uncles, nieces, nephews, cousins and friends. He was preceded in death by his father, Nelson Nieves DeJesús, and his grandmother, Ignacia Soto de Jesús. The family wishes to extend sincere thanks to Elizabeth, Jennifer, Heather, Laura, Carol Ann and Louise at DaVita Home Dialysis Center in Brookstone; Dr. Tamorie Smith at Renal Associates; Dr. Ivy Mallisham; Dan Rose at Columbus Psychological Association; Shaquana Brown at Amedysis Home Health; Nina Moore at the Wound Center; and Heather, Ann, Karen, Pat, Melissa, Barbara, Melanie, Diane, Mandy, Steve, Tresha and Cathy at Kindred Hospice who provided extraordinary care to George and ministered to them as he prepared for his journey to his eternal home. A celebration of George’s life will be held Monday, April 16, 2018, 3:00 pm at Cascade Hills Church with Pastor Gene Boyd officiating. The family will receive friends at Vance-Brooks Funeral Home 4048 Macon Road Columbus, Georgia 31907 on Sunday, April 15, 2018 from 6:00-8:00 P.M. EST. In lieu of flowers, memorial donations may be made to the American Kidney Fund, 11921 Rockville Pike, Suite 300, Rockville, MD 20852.